Sometimes even when you are on vacation and in a completely different part of the world, Monday is Monday. You know those Monday’s when you get up on the wrong side of the bed and nothing seems to go right and you just chalk it up to being Monday? 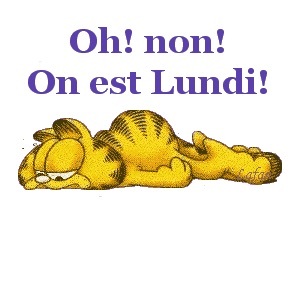 Well, here in France, sometimes lundi is just lundi, and this past Monday was one of those days. Not all bad, bien sûr, because we ARE in France and we ARE on vacation, but here’s how it went. We got up and had our usual gourmet (it says so right on the side of the cornflakes box) breakfast of yogurt topped with cornflakes and fresh strawberries which was delicious. This is actually a very common petit déjeuner we experienced on our previous trip and decided to replicate. After breakfast, we were anxious to walk back to the farmer’s market to pick up some more fresh vegetables. One of the two markets nearby is supposed to be held every day of the week, but, alas, when we got there we found only one vendor with a very poor selection. Quel dommage! Well, at least we got our walk in for the day. When we returned “home” again, we had to wait for someone connected to the owner of our apartment to come and give us a receipt for the €300 security deposit we entrusted to the woman we assume was the owner’s personal assistant on Saturday. It has been our experience that quite often when the rental contract states that a security deposit is required upon arrival, most people haven’t asked us for it. I suppose we look like trustworthy tenants. This time, Norman made the mistake of asking about paying the deposit and completely complicated things. The woman who turned over the keys to us had no idea what he was talking about, nevertheless, once he mentioned it, she then felt obligated to follow through but didn’t really know how to handle it. The conversation was in French so we had a difficult time explaining the situation. Interesting because every e-mail communication the owners have exchanged with me has been in fairly fluent English. So either they have someone helping them answer e-mails or Google Translate works much better for the French. Though we can sympathize because we’re at the point where we can read and write French decently but speaking and understanding it, well, that’s going to take awhile. Anyway, eventually, the owners’ daughter showed up (we had to guess this is who she was because none of the French ever introduce themselves to us… pourquoi?) and we took care of that confusing business. Next item on our agenda was to locate an art store we found online where Norman could buy a larger paintbrush for his watercolors. However, since the store’s hours included the usual closure between noon and 2:00, we had some time to kill. So we decided to venture out to one of the three small communities that serve as suburbs to Périgueux and check out the Leclerc shopping center there. This seemed a simple task, but no sooner than we arrived, Norman realized he didn’t know where he had put the set of house keys belonging to our apartment. There are several keys for various doors plus an electric garage door opener for the parking garage. He scoured every inch of the car for about 20 minutes and didn’t succeed in finding them. He knew the keys had to be in the car because he had to use the garage door opener to get out of the parking garage and we didn’t stop anywhere else so we couldn’t have lost them. Norman was beginning to get really stressed out and upset when he started thinking about what a nightmare it would be if we couldn’t find the keys — no way to get back in to the apartment, no way to contact the owners, and the cost of replacing them… Ooh, là, là! There goes our €300 deposit. At last, we both made one more try at locating the keys. I reached into the console compartment between the front seats and remembered that there was a sliding drink holder that flips over and reveals sort of a hidden receptacle… and there they were! Ouf!! Disaster avoided but not without a lot of unnecessary stress. Finally, we made our way into the shopping mall, found a place to sit, and took a few deep breaths. Once we had composed ourselves, we explored the most gigantic Leclerc hypermarket we have seen yet. This store even had large and small kitchen appliances, TVs, and cameras. We have always heard that these items are very expensive in France and when it comes to refrigerators, stoves, washers, and dryers, they are often much smaller than American appliances so we were curious to see what they were like. Mon Dieu! What a surprise! We found very nice, full-size appliances in the range of €200-500 ($220-550 at today’s exchange rate). One 60″ LCD TV with the latest technology was only €600 ($675). We also found just about every small kitchen appliance you could imagine for very reasonable prices. As we walked through the rest of the aisles in the store, we saw that there was pretty much everything you would need for your home and all very affordable. This might seem like a strange way to spend your vacation — checking out stores and prices instead of seeing the sights, but that’s part of the research we came here to do. It helped us realize that many of the items we thought we would want or need to bring with us if we move here won’t be necessary. That will certainly make our shipping container lighter. Given that it has been very warm here with temperatures in the 90’s, Norman was hoping to pick up a couple more pairs of lightweight shorts. Leclerc also carries clothing so we looked through the men’s section to see what we could find. During the summer, many French men both young and old tend to wear very narrow fitting knee-length shorts, often with cuffs, or three-quarter length lightweight pants known to us as crop pants when they are dressing casually. This is not exactly Norman’s style. I was wondering if we would find anything that would suit him. We actually did but then had to figure out sizes. Of course they are different than American sizes, but I had forgotten to look up the conversion beforehand. Knowing he had to make sure they fit, the next issue was trying to remember how to ask if he could try them on. Zut! Those translators on your phone don’t work without a connection! He managed to figure out where the dressing room was and used a couple of words and gestures to accomplish the task. We weren’t surprised when the shorts he picked out didn’t fit, and we came to the conclusion that we had to save clothes shopping for another time when we had more accurate sizing information. So far we had been frustrated at almost every turn. In the end, we picked up a few things for dinner and headed “home” once again because by this time, we were both exhausted. Purchasing the paintbrush would have to wait for another day. Eventually, once we had both recuperated from the day’s events, we were able to spend an enjoyable evening in our Périgueux apartment. Norman busied himself in the kitchen and I assisted setting timers and washing dishes. After about an hour, he produced an excellent version of his famous Salade Niçoise for that evening and a delicious cold Zucchini Soup for the next night’s dinner. Génial! *With a nod to The Mamas & The Papas for those old enough to remember. Oh, dear! That was a very Monday, Monday! Seems like they happen every once in a while. The simplest things take forever to accomplish even if you are living in your native land and speak the language! And until you find lost keys, the tension is almost unbearable. They usually turn up in the most inconceivable places, which is why you don’t check those places until you have exhausted all the logical ones! You’re right about that, Sandy! Cheryl, You have all of my sympathy. Misplacing items is so very frustrating, especially when it is so very hot. I don’t enjoy the heat so you can tell that I can hardly wait until fall. Naturally, our air conditioner is not working and we cannot get a repairperson to come until the first week in August. Until then we go out for Happy Hours, see a few movies and I spend time on ice packs to cool down and help eliminate the pain in my left foot and right knee. I need to have second operations on both but I do want to put them off until summer is over. I am glad that you found reasonable prices for appliances. Now to find the perfect location. I would gladly wash dishes, clothes etc. if my husband fixed nice means. It is hard to re-train a man after 58 years. I messed up long ago but in my generation women just did the cooking. I know that your 60th birthday is coming up. When? So glad you are enjoying the blog, Carolyn. I will be celebrating the big 6-0 in Bordeaux on July 31st… staying in an air conditioned apartment!